Coated with rows of blue tiles and covered with a blue-glazed roof, Blue Church of St. Elizabeth looks like a giant wedding cake, according to many. The candy-colored church was built around 1908 in the Hungarian secessionist style and first served as the chapel of the neighboring high school. Everything about the church bears resemblance to a cake--its shape, the facade's light blue color, and the white, frosting-like ornaments. A cylindrical church tower rises 37 m (120 ft) from the ground. Notice the circular mosaic of St. Elizabeth of Hungary above the main portal and the altar decorated with the image of her giving alms to the poor. 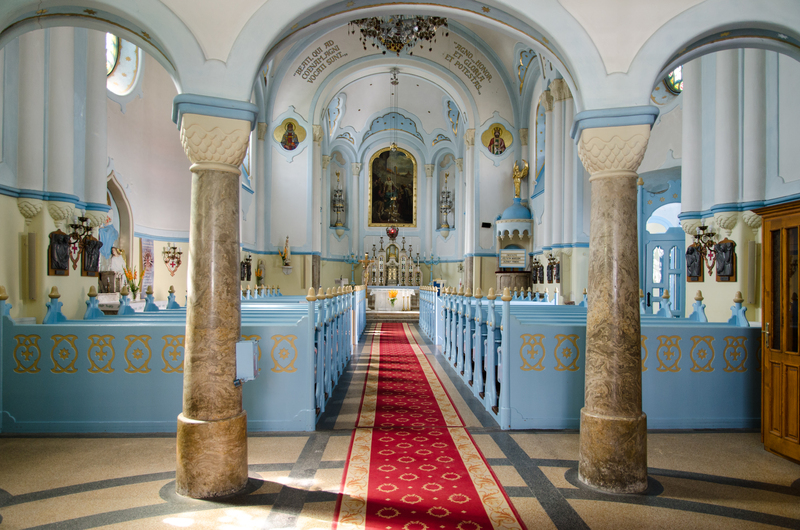 See Blue Church of St. Elizabeth and all Bratislava has to offer by arranging your trip with our Bratislava itinerary planner. It is very beautiful and particular, next door there is a garden with a building always of the same color and style. Something unique..
A lovely cute little church, in the heart of Bratislava. Love the blue colour and complements well a blue sky. Lovely place to take some photos and a top Instagram site. Walking distance from the centre also which makes it great. Opens on Sunday for Mass at noon. It’s blue alright and it looked very serene in the snowy morning. Their website says they are open but when I got there at 9:20 AM the church was closed. I went in through a side door but the main worship area was closed. Very nice and funky looking church stricter (looks like a bubble-gum). The glazed tiling was special but it didn't feel much like a church. Check the timings of church before going. Built in 1913 it was the chapel of the nearby high school. Now a Catholic Church. Unusual so worth the walk to see . Every day, we help thousands of travelers plan great vacations. Here are some tips on how to use your Listing Page to attract more travelers to your business - Blue Church of St. Elizabeth. Promote your permanent link - https://www.inspirock.com/slovakia/bratislava/blue-church-of-st-elizabeth-a111046791 - on your website, your blog, and social media. When a traveler builds a plan from this page, the itinerary automatically includes Blue Church of St. Elizabeth. This is a great way for travelers looking for a great vacation in your city or country to also experience Blue Church of St. Elizabeth. Promoting your link also lets your audience know that you are featured on a rapidly growing travel site. In addition, the more this page is used, the more we will promote Blue Church of St. Elizabeth to other Inspirock users. For best results, use the customized Trip Planning Widget for Blue Church of St. Elizabeth on your website. It has all the advantages mentioned above, plus users to your site can conveniently access it directly on your site. Visitors to your site will appreciate you offering them help with planning their vacation. Setting this up takes just a few minutes - Click here for instructions.